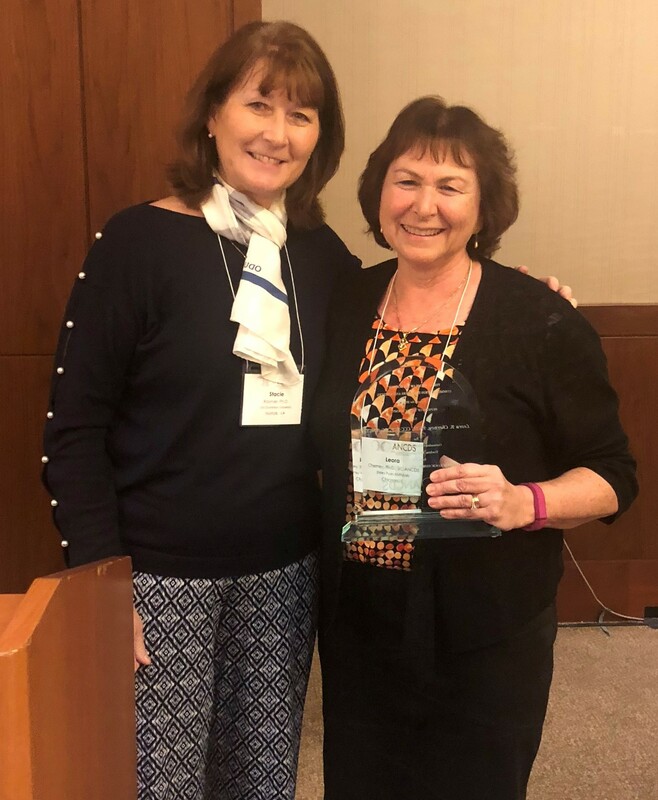 The ANCDS is pleased to present the 2018 Honors of the Academy of Neurologic Communication Sciences and Disorders to our distinguished colleague and valued friend, Leora R. Cherney, Ph.D., BC-ANCDS. of the Academy Award at the 2018 Annual Scientific & Business Meeting. ANCDS recognized Leora Cherney, Ph.D., Scientific Chair and Coleman Foundation Chair at the Shirley Ryan AbilityLab, Chicago, IL (formerly Rehabilitation Institute of Chicago), and Professor at Northwestern University, as the recipient of the 2018 ANCDS Honors of the Academy award. She received the award at a ceremony during the ANCDS Annual Scientific and Business Meeting in Boston, MA, on November 14. The Honors of the ANCDS, the highest honor of the Academy, recognizes ANCDS members who have made outstanding contributions to research, teaching, treatment, and/or service in the area of neurologic communication disorders. Dr. Cherney is an internationally recognized expert in aphasia and communication impairments associated with stroke, traumatic brain injury, and right hemisphere disorders. Her accomplishments include more than $10 million in funding for more than 20 research grants that have led to hundreds of research papers, chapters, and presentations, as well as five books that promote intensive, innovative, evidence-based treatments for neurologic communication disorders. She is a recipient of the Excellence in Post-Acute Stroke Award from the American Congress of Rehabilitation Medicine and is a Fellow of the American Speech-Language-Hearing Association. Her career has spanned clinical and academic settings where she has served as administrator, teacher, researcher, consultant, and mentor. She has been a leader in ANCDS as a past executive board member, certification board chair, and secretary. For more information about the Honors and other ANCDS awards, please visit www.ancds.org/honors-of-the-ancds. Nominations for the 2019 recipient will be solicited in April 2019. If you have any questions, please contact the ANCDS Honors Committee chair, Stacie Raymer, Ph.D., at [email protected].